GFG: Was there anything in particular that inspired “After”? KCN: I was thinking about the idea of things that are meant to be – would we still love the people we love, even under completely different circumstances, even if they were essentially different people? Even if we were different people? Some things certainly seem inevitable. GFG: What’s the most important thing you’ve ever forgotten? KCN: How to be completely unguarded in the company of the people I love. KCN: When I’m writing, I very rarely know what will happen next. I like discovering some new dimension to a character that makes them more human, and figuring out an ending that will make it all come together. I like getting really lost in a story, in another world. KCN: A story of mine was recently published in Writers of the Future Volume 30, alongside some truly excellent work. You can also tweet me @KC_Norton if that tickles your fancy. 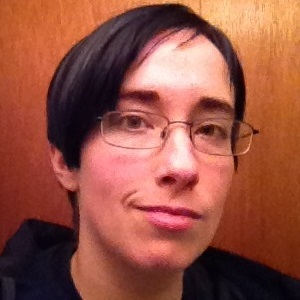 K. C. Norton’s work has appeared in Writers of the Future, Crossed Genres Magazine, Orson Scott Card’s Intergalactic Medicine Show, and Daily Science Fiction, and her short story “Canth” is forthcoming in Lightspeed’s Women Destroy Science Fiction! special issue. She shares her apartment with a small dog who is not named after a superhero.